SASI Releases New Report: ONE SIZE DOES NOT FIT ALL: What Does High Impact Prevention Funding Mean for Community-Based Organizations in the Deep South? ONE SIZE DOES NOT FIT ALL: What Does High Impact Prevention Funding Mean for Community-Based Organizations in the Deep South? underscores concerns that the Centers for Disease Control and Prevention’s (CDC’s) High Impact HIV Prevention funding policy creates a “one size fits all” approach that does not adequately address the HIV prevention needs in parts of the country with large rural (non-metropolitan) and suburban (metropolitan areas of 50,000 to 499,000 population) HIV epidemics. SASI calls on HRSA to increase Ryan White Part B Supplemental funding to regions in most need. Read the full SASI Call to Action and consider signing on to the AIDS Institute’s Sign on Letter asking HRSA to Review Ryan White Part B Supplemental Grant Process. Deadline is Tuesday, March 3rd. #RyanWhiteWorks. Ryan White. Real Lives. Meet Jean B. When I was diagnosed with HIV, I was overwhelmed. I live in a rural area where the stigma meant I was going to have to find a provider outside of my community for my safety. I didn’t know where to start. I can tell you that the case management aspect of the program has played a huge role in my health. The Ryan White case manager was there to guide me through the paperwork and the healthcare and Medicaid systems so I’d get the care I needed with a provider outside my rural county. In 2011, an estimated 12,336 Tennessee residents received services through Ryan White. Edwin Brandon is one of those Tennesseans. 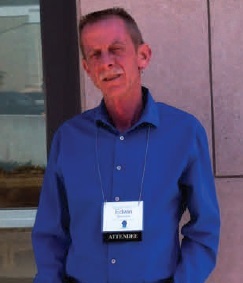 He considers himself a long-term survivor, having lived with HIV for 31 years. Living 140 miles round-trip from his primary care physician, Edwin relies on the Ryan White transportation assistance to get him to the life-saving care he needs. Meet Alicia Diggs and Take Action!